Is It OK To Cry At Work? I will never forget the one time I cried at work. Years ago, I was with my small and growing team, working out of a shared space in the office of a Board member’s company. We were all out in the open- there was no place to hide. Any conversation, phone call, or intimate moment was revealed to everyone from both companies. This was four years ago, and as a young leader I was encountering the first of what would be many challenges that seemed at the time to be potentially organization-altering. We were at a crossroads I hadn’t seen before. The Board member and CEO of the company whose space we were sharing pulled me into his office for a stern lecture and tough questioning. Feeling the weight of the immense responsibility I was carrying in those early years- meeting payroll, providing for people’s livelihoods, paying New York City office rent- I cracked under those stern questions and the acute pressure. Tears rolled down my cheeks. As much as I tried to pull it together, the tears wouldn’t stop. I was able to articulate my points even through the tears, but the tears were there and they were obvious. And awkward. And embarrassing. This was a person I look up to. And certainly someone I didn’t want privy to me losing it. The stigma of crying at work is still very much real, but when 1 out of every 4 adults globally experience a mental health issue each year, why is it still the norm to stifle emotions instead of supporting them? Thankfully this Board member responded with respect and compassion, and he and I look back on that memory with fondness and laugh. I have not since cried at work. Four years later, I have come up against similar crossroads multiple times, but now I am able to recognize those patterns I’ve seen before and have the tools to know how to navigate those challenges. Have you ever cried at work? Maybe. If yes, what triggered you? Jerry Garcia’s death. Where did you cry? In front of anyone? Alone. How did you feel in the moment? Afterward? Sad. Could you imagine yourself crying again at work? Nope. If you’ve never cried at work, what are your thoughts on tears in the office? Better to keep emotions to a minimum at work. Have you seen someone cry at work? Don’t think so. If so, it didn’t make much of an impression. All in the misty past. If you’ve never seen someone cry at work, how would you react in that situation? Depends. I imagine it would be awkward, but there are so many reasons one might cry at work. Grief at hearing of the loss of a loved one. Horrible interaction with a boss / coworker. Hyper-emotionality due to life stress outside of work. I might react with anger if the person crying was being treated unjustly. I might attempt to be comforting if that was appropriate. Have you ever cried at work? Yes. If yes, what triggered you? Mom calling to tell me cancer was back with a vengeance. Where did you cry? In front of anyone? At my desk which was in a cubicle an open space, so yes, in front of anyone who walked by. How did you feel in the moment? Afterward? A hot mess? And embarrassed once I realized I was openly crying. Could you imagine yourself crying again at work? I hope not!!! But I guess it’s possible. If yes, under what circumstances? Most likely personal, not related to work. What are your thoughts on tears in the office? I’m not a big fan of tears in general, but tears at the office are the same as anywhere else I suppose. I would try to comfort the person if possible, or leave them be if I didn’t know them very well. If yes, what triggered you? Co-workers ganging up on me being jerks, getting laid off, telling a team that I loved that I was leaving. Where did you cry? In front of anyone? Yes, all three times in front of people. But always in office, enclosed spaces, not out in the open. I would have preferred it to be in front of no one. How did you feel in the moment? Afterward? Pathetic. Sadly, I always wished I wasn’t crying but obviously I could not stop myself. I know it’s wrong to feel that way, but I think displaying emotions have a time and a place. In most cases, you co-workers are not your friends or people who know you really well. I would prefer to keep things professional and crying, in my eyes, does not appear professional, polished, and put together. Could you imagine yourself crying again at work? No. Have you seen someone cry at work? If yes, how did you react? Yes, I tried to remove myself from the situation as quickly as possible. If yes, what triggered you? The first time I cried in front of my current team was when we watched Hillary Clinton’s speech the day after the election. Where did you cry? In front of anyone? In our office conference room, sitting in front of the tv. My full team was there. How did you feel in the moment? Afterward? I felt good for experiencing a moment of history with my team and responding to it authentically. Could you imagine yourself crying again at work? Honestly, probably not. What are your thoughts on tears in the office? In the past, when I was younger and worked for other bosses, I would only cry in the bathroom at work. This would happen when I would get feedback I took personally. Now that I am the boss, I hold a lot of negative emotions in, but make sure to share a lot of the positive emotions. Have you seen someone cry at work? If yes, how did you react? Yes, by giving them a hug. Have you ever cried at work? No. Could you imagine yourself crying at work? Possibly. If yes, under what circumstances? If I was fired or a personal/family situation overtook my emotions. 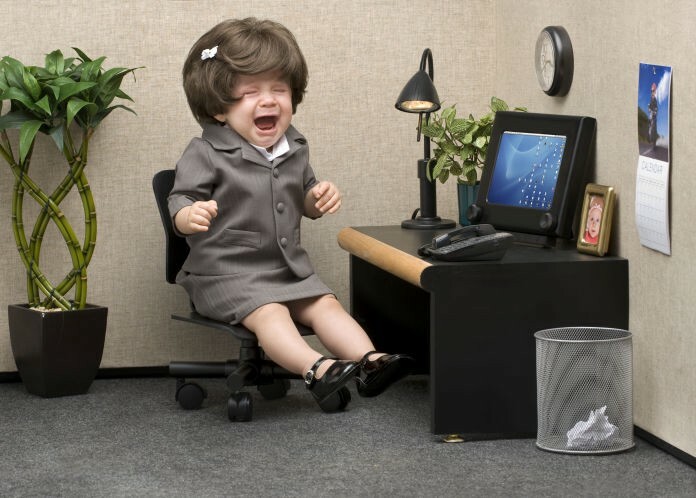 If you’ve never cried at work, what are your thoughts on tears in the office? In my opinion, I think it is unprofessional if it is not warranted. People react differently to stress and work, but crying about work doesn’t seem productive for anyone. Going to the gym or unwinding with friends after work are better alternatives, but I know that everyone is different. Have you seen someone cry at work? If yes, how did you react? Yes. I have seen it happen a couple of times, and in each instance I read the situation and acted accordingly. One time a co-worker had a family emergency so I was very conscious of their feelings and made sure they knew that I was there for them. The other few times someone was reprimanded and I tried to show empathy but also tried to recognize what their mistake was so I wouldn’t do the same. If yes, what triggered you? One of our teachers had passed away. Where did you cry? In front of anyone? Many of us were crying, including the Principal, faculty and staff. How did you feel in the moment? Afterward? I do not cry easy so I was a bit embarrassed at the moment, but relieved as well, because it was not only me crying. I was not crying about something I was uniquely experiencing. Could you imagine yourself crying again at work? No, but you never know. Have you seen someone cry at work? If yes, how did you react? Yes, I gave them space to cry and then talked to the employee to understand why she was crying in order to help her sort through it. If yes, what triggered you? It was nothing to do with work, or the people at work, or any specific incident at work. It was because of personal reasons and nothing specifically triggered me, things were simply overwhelming and I couldn’t get it out of my head when I got to work. Where did you cry? In front of anyone? In the bathroom. How did you feel in the moment? Afterward? Well I thought crying would take it out of my system but afterward I realized that it had not. Could you imagine yourself crying again at work? Yes, but not for work-related reasons. Have you seen someone cry at work? No. If you’ve never seen someone cry at work, how would you react in that situation? If we are surrounded by other people, I would bring the person to a quiet area, and ask if everything is alright, and try to comfort him/her, and remind them that crying is alright, that they are allowed to cry. If they don’t want to talk about it, I would reinforce that they can come to me any time. If yes, what triggered you? Frustration, overwhelmed, unsupported. Where did you cry? In front of anyone? In front of a colleague in my office. How did you feel in the moment? Afterward? In the moment I tried to hold my feelings in but after felt much better! Have you seen someone cry at work? If yes, how did you react? Yes, I listened and supported them; gave them a quick break for their students if possible. Whether inspired from work or our personal life, there inevitably exists that moment for each of us when we’re struck with despair or confusion, no matter how strong our ability to manage our emotions. And the same goes for those around us, which is why we sought to explore the stigma of crying in the office. Being vulnerable at the appropriate time allows colleagues to understand the motivation for our behavior and build meaningful, lasting connections. It allows those around us to see us as human beings; imperfect and unabashed. In fact, perfectionism only “hampers achievement…and is correlated with depression, anxiety, addiction and life paralysis or missed opportunities.” No one is perfect, so why hold yourself to an unattainable standard? No matter your opinion, emotions are real and cannot be ignored, so it’s up to us to harness them and make them work for us, even at work. Where do you fall on the spectrum of allowing emotions at work to show themselves? Share your responses with us at @move_thisworld.